As if there weren't a lot of reasons to attend this year's Gun Blogger Rendezvous, here's even one more, a Ruger Single Action .357 Magnum revolver. I think I managed to wipe all of the drool off of the pistol before, taking the picture, but it wasn't easy! It is even nicer looking in person. This picture doesn't do it justice. 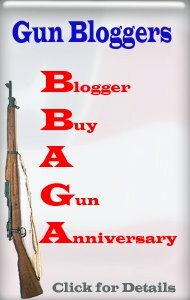 Go to the Gun Blogger Rendezvous website to see the event schedule and to get the details to register for the Rendezvous and book your room. I am a bit embarrassed to admit it, but I have bought four Rugers in the last year. A family member recently went shopping and a Shopkeeper followed him home. I bought one of these stainless .357's in 1982, and it is one of our go-to guns. It is currently loaded with snake rounds. The Mrs. LOVES to kill snakes around our bluebird houses with that gun. A Hot Steamy Night, But No Fun! Too Busy doin' Stuff to Blog About It!